The Masonic Boys' Orphan School of Ireland 1867-1892. From the Book of the Centenary, pages 26-31, published 1892, compiled and Edited by Bro. Thomas Stuart, Lodge No. 125. As I have sanguine hopes of speedily submitting to the Masonic Order a plan for the Education and Maintenance of a certain number of the orphan boys of our departed brethren, will you be kind enough to attend a preliminary meeting at the Free­masons' Hall on Friday, the 26th inst., at Four o'clock p.m., when I purpose to state certain facts to a few influential Brethren I have summoned for that purpose. Henry H. J. Westby, P.G.C. Rev. Bro. Henry H. J. Westby, 33°, P.G.C. The preliminary meeting was held, and a month later a second gathering assembled, at which a Provisional Committee was formed for the purpose of collecting subscriptions and formulating a scheme for organising the project. The first appeal made to the Order on behalf of the plan for educating and maintaining the orphaned sons of their deceased Brethren met with so ready and liberal a response that within one year £1,718 had been subscribed, and a large pro­portion of the subscriptions included in that amount were promised to be renewed annually. The Provisional Committee, in the face of this practical interest and secured annual income, felt justified in recommending that immediate action should be taken in order that the first benefits of the movement might be extended to some of the orphan boys who, at the time, stood in need of assistance. Bro. Thomas Valentine, 32° Vice-Patron of the M.F.O.S.I., Presi­dent of the Belfast Masonic Charities. In 1868 the resources placed at the Committee's disposal had multiplied to such good purpose that a fund of, £2,100 had accu­mulated to the credit of the undertaking, and was invested in India four per cent, stock, and in Freemasons' Hall shares. The work so well commenced in the Metropolis was not confined to it, for the North and South, represented respectively by Bro. Thomas Valentine, Vice-Patron of the M.F.O.S.I., P.D.G.M. 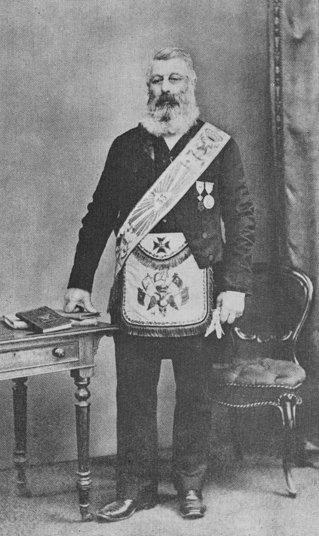 Ant., Presi­dent of the Belfast Masonic Charities, and Bro. W. E. Gumbleton, Vice-Patron of the M.F.O.S.I., P.G.D. Eng., united in exertions for the common good of the undertaking. With the dividends from this investment, and the promised annual subscriptions as income, a commencement was made by the election of five orphans, who were placed at the Incorporated Society's School at Ballymun, near Santry, County Dublin, the idea of the Committee being to continue the boys at some suitable boarding-school until such time as the receipts would justify the Committee in buying or building a schoolhouse of their own. This initial election of five boys took place in 1869, and the number was increased annually until the year 1872, when the boys, then fifteen in number, were withdrawn from the Incorporated Society's School and placed under the guardianship of the Rev. S. S. Skeen, at Adelaide Hall, Merrion, and continued with him until, in 1878, the Governors of the M.O.B.S. purchased Mr. Skeen's interest in the lease of Adelaide Hall, and continued the seminary as an exclusively Masonic Institution. A master and a matron were appointed by the Board of Governors, and on the 20th August, 1879, the New Masonic Orphan Boys' Schools started on its career with twenty-six pupils. of love, every corner in the County of Dublin at all convenient to the city, communicated, in the year 1885, the glad tidings that the pleasantly-situated suburb of Clonskeagh had afforded the long-sought for desideratum. Richview was the name of the pleasant place which was destined to become the Mecca of the Masonic Orphan Boy; the residence was, it is true, somewhat dilapidated, but this small drawback was unworthy of consideration when the price (£3,500), all things considered, proved conveniently reason­able, and the twenty-four acres of good land surrounding Richview presented the advantage of being certain contributories to the exchequer, and a sure benefit, far beyond all considerations of pecuniary advantage, to the physical health and well-being of the pupils. This spirited action, and the positive enthusiasm which Bro. Fitzgerald not only developed in favour of the project, but imparted to every one in the least likely to become useful to his darling scheme, so stimulated the subscription list that by the January of 1886, £4,800 was promised by subscribers, and, £3,400 of that sum actually paid into the office. At this point the Board of Governors felt justified by the support received in undertaking a considerable expenditure for the erection of buildings suitable for the purposes of the schools. Bro. Thomas Drew, R.H.A., rendered invaluable help by preparing the designs, plans and specification, for the structural alterations and additions at Richview. The Masons, usually, in building operations follow the Architect, but in this case they worked together con amore—the latter at his plans, while the Masons busied themselves in generously contributing the immense sum of, £10,000, thereby enabling the Governors to at once carry into effect the plans provided by Bro. Drew. The work was executed by Bro. Sharpe, and in such a manner that the Schools were handed over to the Governors, at the completion of his contract, so complete in point of equipment and accommodation as to compare favourably with the best educational establishment in the Kingdom. A "Slideshow" of three photographs taken at Richview, Masonic Boys' School, from circa 1898. The education which the boys of the Masonic Orphan Schools receive is of the soundest and most comprehensive character. The subjects taught are—Scripture, English, Mathematics, Latin, French, Shorthand, Drawing, Experimental Physics, and Chemistry, and their progress and proficiency is tested once a year, at Easter­tide, by an examination, held at the Schools, of all the pupils, by Examiners appointed by the Education Committee of the Schools. In addition to this examination, which is fully reported in the Annual School Report of the Boys' School, the pupils attend the Diocesan Examinations in Scripture, the Science and Art Exami­nations in Science, and the Intermediate Examinations. Since 1885, Two Hundred and Sixty-three were examined at the Diocesan Examinations, and of these One Hundred and Fifty-four were awarded Book Prizes; Forty-eight, Certificates of Merit and Fifty-three, Ordinary Certificates. The percentage of failure was trivial indeed, only eight pupils having failed to satisfy the Examiners. Within the same period the Boys gained £42 in Book Prizes at the Science and Intermediate Examinations; Exhibitions value £385 from the Intermediate Board; and the sum of £487 was received as Results' Fees. Three of the boys who obtained Intermediate Exhibitions were able, when leaving the school, to pay their fees and enter T.C.D., where they are having successful careers. All three have obtained honours in Mathematics, two of the honours being first. Six "Old Boys" are attending medical lectures, three at the Queen's Colleges, two at the Royal College of Surgeons, and one, who has but one other examination to pass, in London. Six have obtained clerkships in banks, two in insurance, and seven in other offices. Three have adopted the sea as a career, two as apprentices (one of whom is now Second Mate), and one as Engineer. One boy is Mathematical Master in an Intermediate school and ten have sought their daily bread in business pursuits. The proficiency attained in Shorthand at the school by one boy obtained for him immediate employment on the staff of a newspaper. The health of the pupils has been remarkably good since they went into residence at Richview, and the attention bestowed on them by the Hon. Physician of the School, Bro. J. H. Chapman, M.D., is unremitting. He has now for many years, when occasion required, given the advantages of his professional skill to the pupils. The other hon. officers are Bro. Sir George Porter, Bart., D.L., and Bro. H. R. Swanzy, F.R.C.S.I., who both use their best efforts for the boys when necessity arises. The number of pupils at present in the School is Sixty-two, which number the Governors have decided on increasing to Sixty-seven after next vacation. Hon. Secretary, Masonic Orphan Boys' School. and two of the Present Pupils (1892). Each pupil is maintained and educated at a cost of about, £25 per annum, and that it can be done, and well done, for this moderate sum is, in no small measure, owing to the close supervision and watchfulness of the Matron, Mrs. Holdbrook, and of the zealous co-operation of the Hon. Sec, Bro. Oliver Fry, who is untiring in his efforts for the well-being of the Schools, devoting his time, experience, and administrative capacity for the benefit of the orphan boys who, in the hour of their dire need, have found a bountiful home, a liberal education, and steadfast friends, at Richview, the fine Masonic School-house in Clonskeagh.